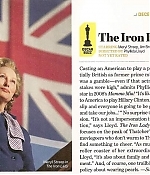 Article courtesy The Hollywood Reporter: Former colleagues and admirers of Margaret Thatcher have mocked Streep’s portrayal of the former British prime minister, but Phyllida Lloyd is unfazed. Less than two months ahead of The Iron Lady’s U.K. release, Meryl Streep’s portrayal of former British prime minister Margaret Thatcher is generating a growing furor among British conservatives bristling at what they consider an unflattering portrayal. Director Phyllida Lloyd (Mamma Mia!) is unfazed by the uproar. 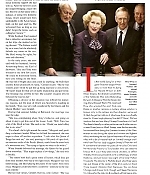 “People have been arguing about her [Thatcher] for months and months,” Lloyd tells THR. “She certainly burns brightly as a still very divisive character.” The movie, made for an estimated $13 million, has been penciled in for a Dec. 30 U.S. release by the Weinstein Co., bowing in exclusive runs in New York and Los Angeles before going wide Jan. 13. It is scheduled to hit U.K. screens Jan. 6 via Pathe’s distribution pact with 20th Century Fox. Much of the opposition to the drama comes from Tory stalwarts and former cabinet ministers who served under Thatcher. 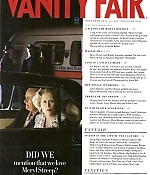 None has seen the film, but the movie’s trailer – which mixes elements of gentle comedy with scenes of Thatcher’s personal and political life – was enough to set them off. The complete article can be read here. 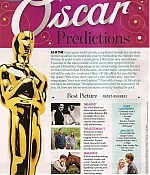 Many thanks to Alvaro for sending in scans from Entertainment Weekly’s Oscar predictions, dishing on Meryl’s Best Actress chances and English accent. 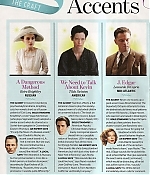 While scans from the Vanity Fair article “Maggie Mia” have been posted already (see here), their website has now published the article as well, with a better quality version of the stunning promotional picture you’ll find below. Is the world dying for a Margaret Thatcher biopic? Probably no more than it’s dying for Harold Wilson or John Major biopics, the dramatic possibilities of the Falklands War notwithstanding. But wait. A Margaret Thatcher biopic starring Meryl Streep? That’s P.M.-tainment! How she wrested the part from one Dame or another remains a mystery whose solution is known only to the actress and her director; we’re just thrilled she got her mitts on it. (And now America is finally even for Vivien Leigh playing Scarlett O’Hara.) Did we mention that we love Meryl Streep? Love-love-LOVE her? 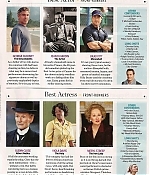 That there’s literally no other performer we’d rather see on-screen? Even Jessica Alba? 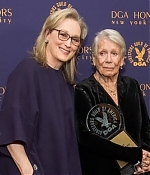 Streep, over the last decade, has evolved from being the Greatest Actress of Her Generation to also being the slyest and wittiest and lightest afoot, ventilating the von Sydow heaviness of her younger roles with a bit of Astaire fresh air. Limited footage available from The Iron Lady suggests Streep’s Thatcher will fit somewhere between the poles of her Julia Child and her Miranda Priestly—a Tory leader who can debone Labour M.P.’s as if they were whole chickens, or stiffen wobbly American presidents with a witheringly arched eyebrow, and yet never lose sight of her inner Python housewife. The director is Phyllida Lloyd, who three years ago put Streep at the center of the 21st century’s finest movie musical: Mamma Mia! (Seriously. You can have Chicago and Dream Girls, though we’ll keep Hairspray too.) 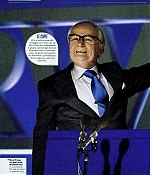 Along for the ride, Jim Broadbent will risk being ahistorically interesting as Denis Thatcher. 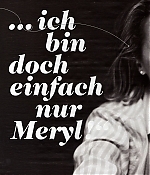 Did we mention that we love Meryl Streep? 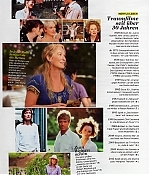 With many thanks to Alvaro, scans from the November 2011 issue of Vanity Fair have been added to the gallery. 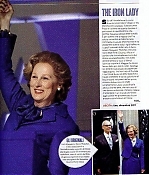 While I was expecting a bigger article, they have a half page on the upcoming “The Iron Lady” with two new stills from the film. 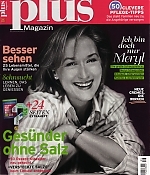 Scans from the September 2011 issue of the German Plus magazine have been added to the image library with thanks to Nadine for the heads-up! Plus is currently on newsstands. 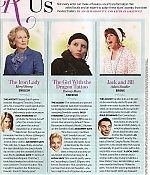 In its 19/26 issue, Entertainment Weekly has previewed the highlights of the 2011 movie season, and of course, “The Iron Lady” is featured. The scan can be found in the gallery with many thanks to Alvaro!